Fast forward to Wednesday. I was in a foul mood from work and ready to just pack my bags and go home. And yet, deep down inside, I felt a pull (probably from my liver) towards the conference room. At 6:20 pm I decided to just get a quick glass (or cup, rather) of wine and get back to sending out a few more e-mails. As is often the case when alcohol is involved, I never did get back to my work that night. There was a huge cheese, cracker, and fruit spread and a sliced vegetable spread. Sparkling apple cider (which later was delicious mixed with jug wine, but I’m getting ahead of myself here), water, and wine wine wine! I’m not the biggest fan of chardonnay so I didn’t catch the name of the example on hand, but there were bottles of rosé and red. I started out with rosé because I love rosé and hell, it’s spring. 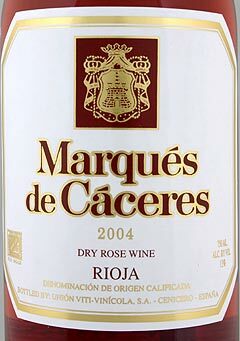 We had bottles of the Marqués de Cáceres rosé, which is made from 80% tempranillo and 20% garnacha–er, grenache, depending on where you’re coming from. It was clean, fresh, refreshing. Very fruity–berry, as in strawberry, red berries–and dry. I was very happy with this wine and ended up drinking maybe four plastic tumblers of the rosé. At around $7.99 a bottle, this is PERFECT for spring and summer. I’m thinking picnics, with roast chicken and French bread. It was a good match for the mild, soft cheeses on the spread, too. The Pont du Rhone was a great example, then, of this style. I couldn’t find its exact composition, but it seemed to be primarily grenache, which meant it had berry and pepper and a lighter body. The nose had a bit of herb, a bit of cherry. It was surprisingly smooth, very gentle, and also a great match for the cheeses at the event. I could imagine having this wine with some good steak frites, maybe even with a goat cheese pizza. The best part of this wine was its price: $4.99! It is a huge steal and a good everyday wine. My teammates were there, as were others from the new sales team as well as the customer support team, which also sits in the same room. Heather was there sharing stories about tasting wine with her husband. James, the manager of the estate planning sales team, was relating how he is in a band and how his knack for motivating lazy bandmates is relevant to his day job. Then the event started winding down. People started leaving, but there was still wine left to be drunk. The evening was about to get even better, though from a wine perspective you might say it was going to get a lot worse. I shall spare the minute details of the rest of the three hours we were there in that conference room. Suffice it to say that Jonathan Lewis from LegalZoom yore dropped by, that we pooled money to buy packs of cigarettes and wine, and somehow Jonathan P. managed to finagle two jugs of wine and three packs of cigarettes from the big, black cashier at Long’s (for the price of one jug and one pack of smokes). 11:30 pm, with about eight glasses of wine, eight cigarettes, a Big Mac combo, and six Chicken McNuggets in me, I finally called it a night. At that moment, saying bye to my coworkers, I told myself that maybe LegalZoom wasn’t so bad. If only they institutionalized Wednesday Wine Night–might be good for morale.